Podcasting is not my job. I’m fortunate enough that I can indulge in something that feeds my soul because I am paid for writing and for consulting (both inside the IBD space and outside of it). There’s no money in podcasting for me as of this writing. I don’t have sponsors and I don’t do it on behalf of someone else. I do it because I had an idea and I wanted to explore it. I gathered my support network around me and I jumped right in with both feet. My daughter asked me why I started a podcast. She thinks it’s my job to podcast. Maybe that’s because podcasting can dominate the conversations at our house; it’s new and it requires investment in time and money. I need quiet to record and while I usually do it when children are otherwise occupied, there are times when I ask for everyone to be cool for a half an hour so as to eliminate background noise. The IBD community matters to me. There is more information and support available now than there has been in any other time, yet there are still gaps. I can count the number of podcasts that cover IBD on one hand. Yet, podcasting is a growing area and there’s so much potential for people with health conditions to learn from one another. I know there were many times in my disease journey where I was bored. Seriously, bone crushingly bored. Pain medication or other factors made it so that concentrating on a book or a TV show were impossible. I spent a lot of time in the 80s and 90s coloring, before it was considered an adult pastime. I had kids’ coloring books, like Sesame Street. And regular Crayola crayons. Turning on the TV meant food commercials at times when I couldn’t eat. Now we have social media to keep us entertained but when you’re not well, that can feel tedious and annoying. In the 80s and 90s I turned to books on tape, which wasn’t easy because you needed batteries and the actual tapes. That turned into CDs (still, batteries) and then audio books and now podcasts. I listen to a variety of podcasts for both learning and for pleasure. Podcasts are free! They’re being made every day by regular people on a vast variety of topics. I encourage you to look beyond the “top” shows and the ones listed on the home page for your podcasting app. Do a little searching. Find topics you’re interested in and give those shows a listen. Don’t like one? Well, don’t listen again. Move on to the next one until you find your tribe and then share the wonder with others. My podcast is about the people who live with IBD and I’ve dragged several of my friends into the idea of listening to my podcast. But I hope that it doesn’t stop there! You have a podcast app on your phone, no matter what it is, you already have one. If you open it up, you’ll find a new world bursting with opportunity. Especially if you find that major media outlets don’t offer the kinds of programming that fits your lifestyle and experiences, you will probably find someone podcasting that suits you better. I listen to podcasts on Star Wars, space exploration, science, literature, pop culture, and politics. A few minutes spent searching and I can always find a new voice. Sometimes they don’t work out. That’s OK — I unsubscribe and move on. 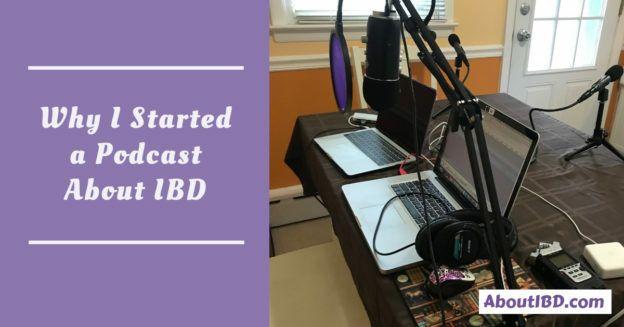 I hope you’ll listen to my show because I love doing it and I want to keep improving and to bring new voices to the conversation about IBD. But more than that, I hope you’ll explore the podcasting world and find the shows and the people that resonate with you because no matter what your passion is: there’s a show for you. I promise. Contact me any time to talk podcasts and podcasting, especially if you want to be a guest on my show! This entry was posted in Podcast and tagged advocacy, awareness, podcast on September 30, 2018 by Amber.